Layouts in the Seattle and surrounding area will be open August 25-26, 2019. Some are listed here; more will be added later as pictures and descriptions of the layouts become available. Feel free to visit them in any order you desire on the days they are open for tour. Specific dates are mentioned in the descriptions below. Buses to these layouts will not be available. The following are open on Friday and Saturday, 23 and 24 August 2019. 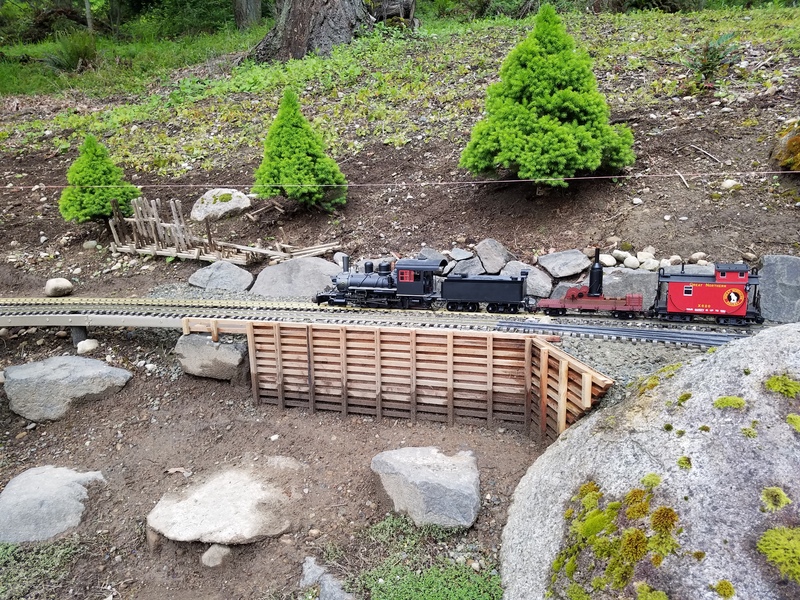 The British Columbia Society of Model Engineers (BCSME) officially opened their Garden Railway on July 6, 2018, completing a planning and building process that started in August of 2011. The railway is freelance, with the objective of promoting the railway history of southern British Columbia. The track is designed to accommodate battery and electric powered locomotives, as well as live steam. In addition to our standard Code 250 brass track there is also 0-Gauge 2-rail and 3-rail track available. 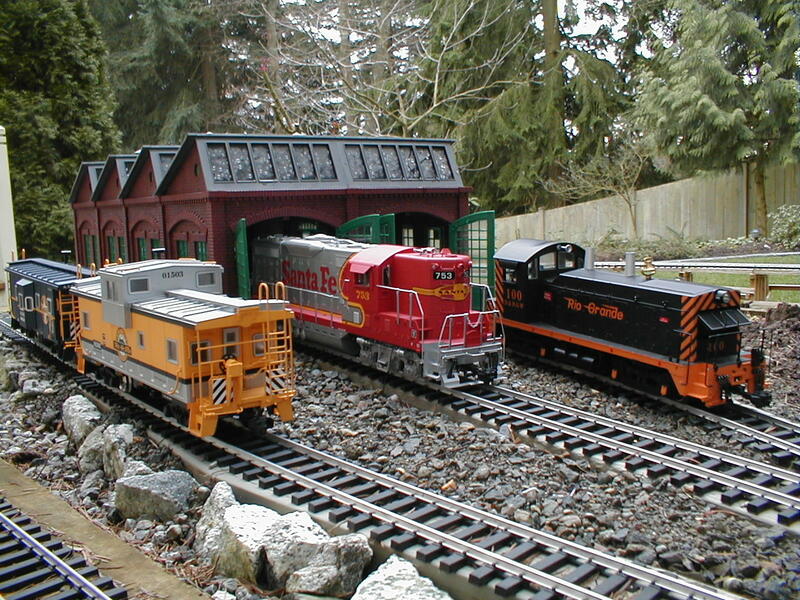 The Garden Railway is part of the Burnaby Central Railway, a 7.5” passenger carrying road that is open to the public annually from the Easter weekend until Canadian Thanksgiving. 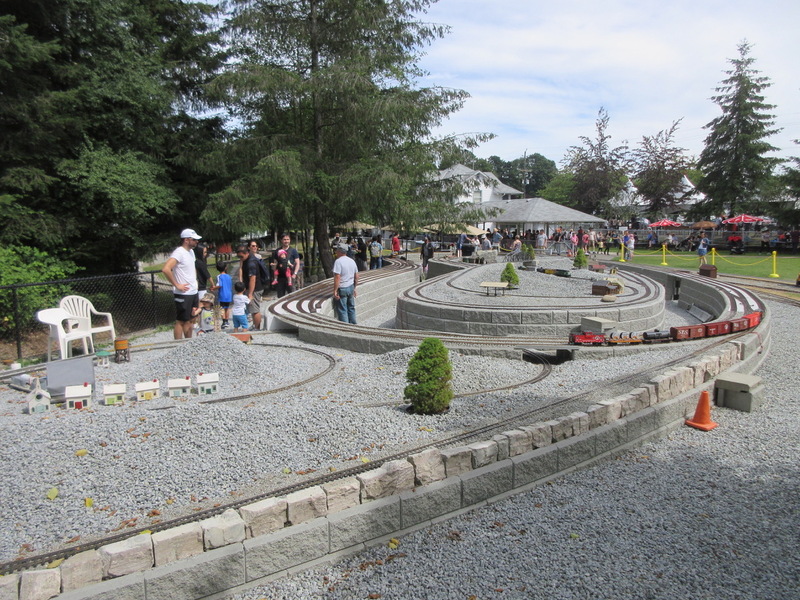 The BCSME Garden Railway Committee is pleased to extend an invitation to our 1st Garden Railway Steam-Up on the weekend of August 23rd and 24th, 2019, prior to the Garden Railway Convention. To get to our 6.5 acre site at Confederation Park in Burnaby, BC, head north on Willingdon Ave from Hwy 1, cross Lougheed Hwy, cross Hastings St., and turn right at Penzance DR., we are on your immediate left. Parking is on street or in one of the two public parking lots nearby. 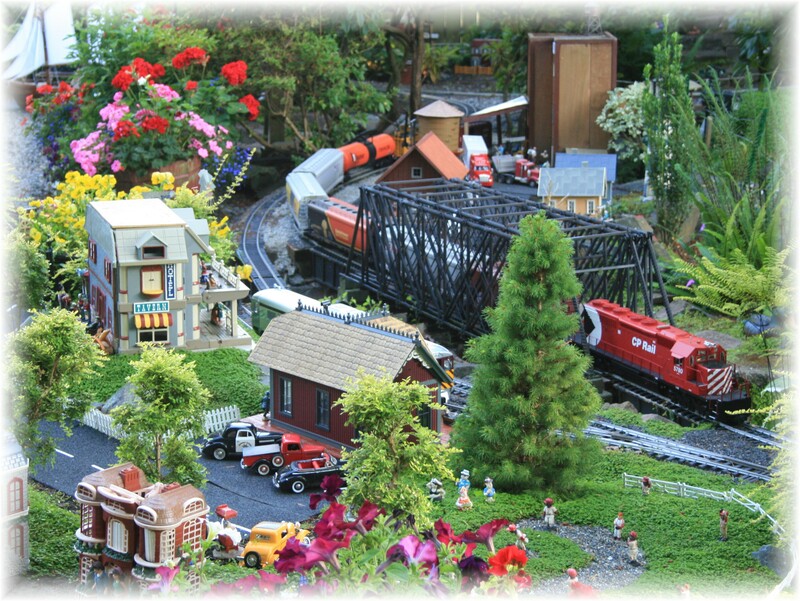 Questions and inquiries are welcome to gardenrailway@bcsme.org. To facilitate our planning please RSVP before August 15th, 2019. Open on Friday and Saturday, 23 and 24 August, 2019. The following are open for tour on Sunday, 25 August 2019. The layout was designed to fit into the existing landscape but, many landscape stones, retaining walls, dirt fills and bridges were completed to provide reasonable grades and areas to add space for features. The track is code 250 aluminum (Llagas, no track power) with 61 turnouts. There is a scratch built operational replica of the Great Northern bascule bridge which spans the Lake Washington Ship canal just below Chittenden Locks in Seattle. There are four other bridges unique to Vancouver Island. We named our railway after the Beaver Cove Lumber and Pulp Company which existed for one year in 1918. It was located in the northern most area of Vancouver Island. We have named our small town Beaver Cove and other segments along the railway are named for towns on Vancouver Island. Train station models have been completed for Nanaimo, Qualicum, Pt Albernie, Parksville, Courtenay, and the Esquimalt round house and turntable. Three others are in the future plans. Canadian Pacific is the chief operator of the line with logging segments operated by Beaver Cove Lumber. We have trains that represent different eras (1880's to 2006) of the passenger and freight operations on Vancouver Island. For the last three years we have hosted an operations day to run 13 different way bills and 6 passenger schedules. Open for tour on Sunday, 25 August, 2019, 9AM to 5PM. The railway is viewable by someone in a wheelchair, but some parts are not accessible. 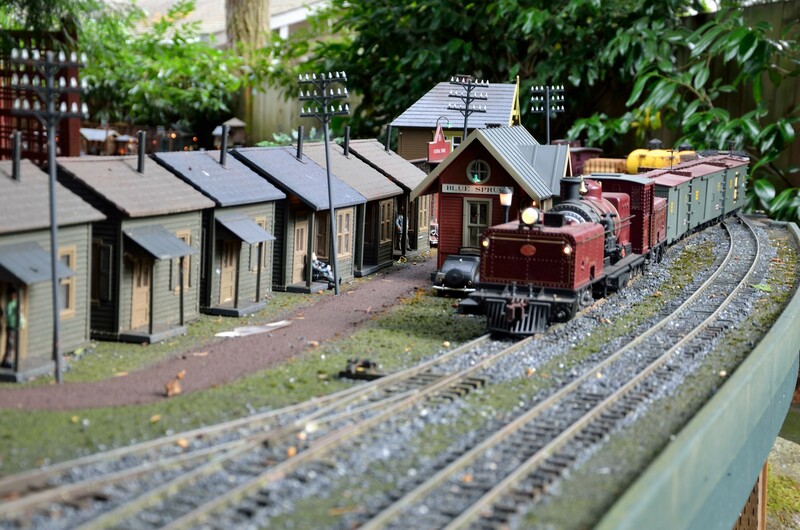 The Dunckley Northern Railway is a large layout covering most of the back yard. It is mostly raised about 3’ off the ground, (see Garden Railways Magazine of Aug. 2012), with towns and passing loops built on “tables”. 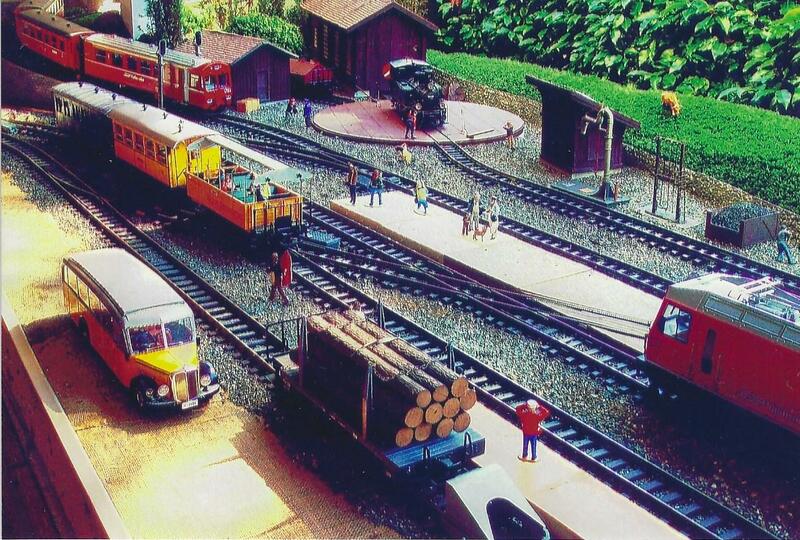 The theme is a 3’ 6” gauge (1/24 scale) colonial line in an unnamed country. It operates with an eclectic collection of mostly scratch built locomotives and rolling stock. As well as conventional rod engines, there are a number of Garratts, Mallets, a Meyer and some vintage diesels on the roster. 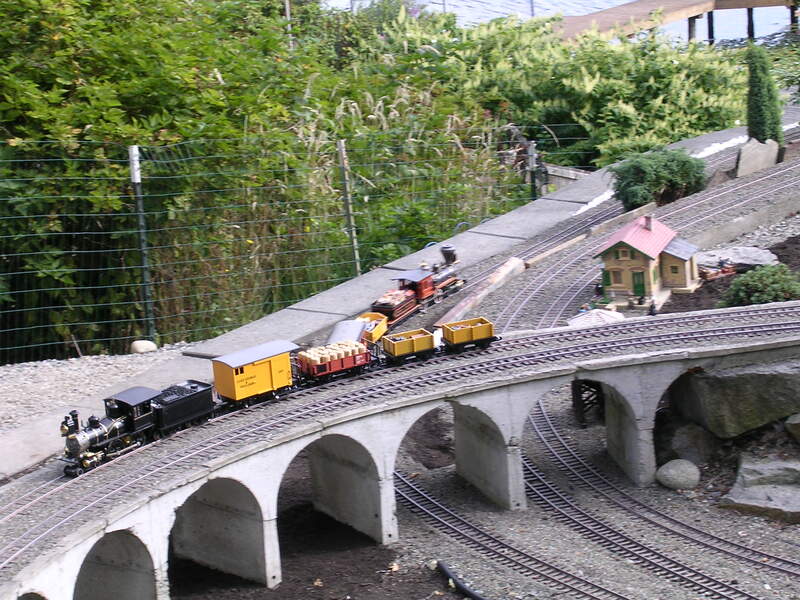 Some of the buildings and infrastructure are also scratch built and a small amount of dual gauge track and switches (3’ 6” and 4’ 8 ½ ”) are installed to accommodate a few standard gauge vehicles of the same scale. The yard is completely wheelchair accessible. See the YouTube video of this layout at https://www.youtube.com/watch?v=nzkP-J-WioE. 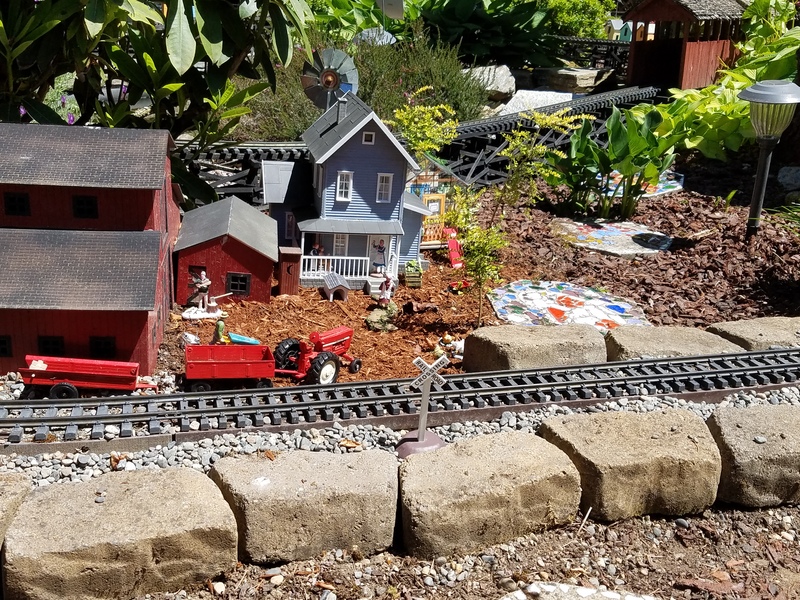 Emerald Heights, a continuing care retirement community, is believed to be the only retirement campus in the nation to operate a garden railway. 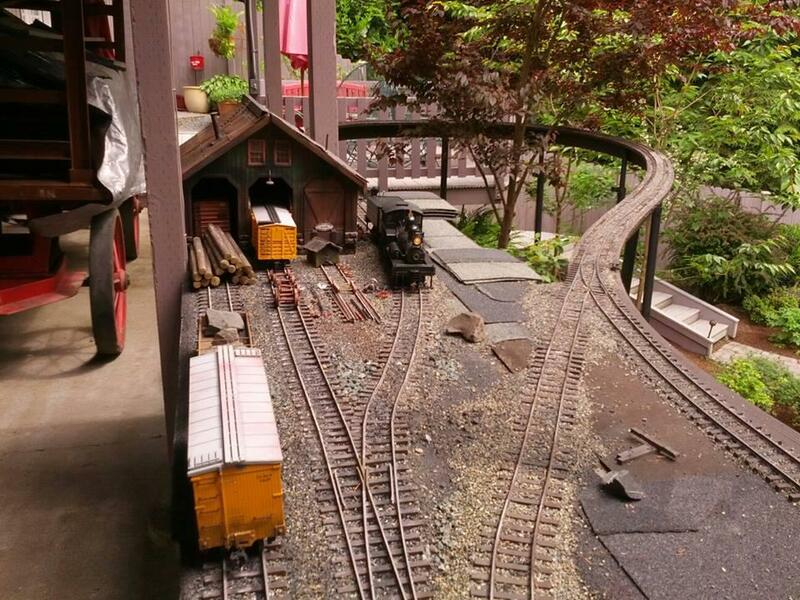 Our garden railroad is based on the actual Seattle, Lake Shore and Eastern Railroad Company. The layout sports 275 feet of track, 22 switches, six bridges and trestles, a mountain, and 45 buildings. Towns depicted are Redmond, Issaquah, Snoqualmie, and North Bend. Most of the buildings are illuminated, providing a cheerful kaleidoscope of lights year round. Open for tour on Sunday, 25 August, 2019, 9AM to 4PM. The Everett and Monte Cristo Railway served between those two towns when Monte Cristo was the center of the biggest gold and silver mining rush of the 1890’s in Washington State. If one wants to visit that ghost town today, it requires a long drive to the Mountain Loop Hwy, followed by a four mile uphill hike over deteriorated logging roads to reach the town site. Since Terry had no John D. Rockefeller backing for his railroad, and could not afford large land acquisitions, he instead acquired “air rights” for its establishment. Here is one of the most unique garden RRs existing in the Puget Sound area. Topping out at one point nearly 11 feet above mean ground level, the mainline appears to float in the upper foliage of several large trees. On the ground are scratch-built reproductions of the concentrator, mine head, and all the usual support gear associated with a successful mining operation. Open for tour on Sunday, 25 August, 2019, 10AM to 4PM. Not handicapped accessible. Steep grade from street to layout. The railroad meanders through most of the rhododendron filled rear and side yard of our home. It is a basic oblong oval with a bulge and three connecting reversing loops. Trains enter through the “Decking Yard” located under the south side of the deck from the train storage shed. Leaving Decking Yard you circumnavigate along a dogwood tree and head east toward Crazy Corner. You then turn, loop around, and head west and up an eighty foot 4% grade to the side yard, engine service area and industrial sidings. We operate a mix-matched schedule of equipment and road names that we like, so there is a large variety of rolling stock and engines. There are several bridges and trestles. The dominating structure is the coal breaker located on the west side of the yard in the industrial area. Handicapped accessible only to back upper level. The Lincoln Pinnacle RR is inspired by the early B&O up through the Civil War. So the only motive power is provided by horses and 4-4-0 locomotives on a double-track layout. There is a replica of the Thomas Viaduct and a Bollman truss bridge over a water feature. A path goes around the layout, its not wheelchair friendly, but there is a large deck overlooking the layout and the lake beyond. The Phantom Lake - Adventure Railroad is located on Phantom Lake in the Bellevue Eastgate area. It consists of two separate, but co-located subdivisions connected by a single track with a combined trackage of about 600 feet. Turnouts are remotely operated from two central locations via pneumatic actuators. The layout is “free lanced”, that is, it is built for pleasure with an emphasis on integrating into a mature garden. Locomotives are battery powered. The connecting track to the subdivisions drops 5 vertical feet over 200+ feet going through mature landscaping consisting primarily of full sized rhododendrons and azaleas next to a large Gunnera plant with two foot plus leaves towering over the connecting elevated track. Several buildings, including a large depot/hotel, a curved trestle, and large and small waterfalls are part of the landscape. Access to the back yard with the train layout is mostly level over lawn and a flagstone pathway, which may be a little rough. Please be careful. Ray started building our layout in 1998. We continued to expand our fun project. We have an overhead layout that is about 47 feet by 17 feet and has two tracks. We run four engines on this layout. We have a u shaped layout that is about 45 feet wide and 41 feet long. This has two main tracks. Then we have an upper layer figure eight layout that is about 16 feet in diameter. This has a mountain with a ski resort, tunnels and a single track. On the u shaped layout, we have a cog railroad that runs up to the ski resort. We do not have a theme. It is very whimsical. We have a western town with cowboys and Indians. We have a brewery, refinery and a village. We also have dragons, unicorns, aliens and Big Foot. We play trains and run for fun. Open for tour on Sunday, 25 August, 2019, 8AM to 4PM. The Schweizerishe Alpen Bahnen, SAB, features the Rhatische Bahn and replicates the Swiss station and yards of Filisure, St. Niklaus and Beernina. Trains are arriving from Davos, and Bernina. A tourist train is also in the process of turning the steam engine around while many of the tourists are taking the opportunity to photograph all of the ongoing activities. Also, a bus is arriving to deliver and pick up passengers. The following are open for tour on Monday, 26 August 2019. The Bismark & Hilldale Railroad is a Victorian style narrow gauge railroad that kept its charm through WWI. Here you have a chance to see 4-4-0 locomotives pulling wooden rolling stock. The Bismark & Hilldale lumber operations are handled by the Tacoma Lumber Company where the uses of geared locomotives are used to haul lumber out of the woods. This railroad is a combination of 1:22.5 and 1:20.3 scales. There are two ponds the railroad navigates around and a small town at one end. There are a few plantings here and there. If you’re lucky and it’s in bloom when you’re here there is a flower that smells like chocolate. Open for tour on Monday, 26 August, 2019, 10AM to 4PM. As the train leaves the Barn crossing a 40” steel truss bridge, it descends 3 degrees on 50 feet of trestles to the main section crossing a small bridge that passes by a Saw Mill & RV park. Continuing around trees until it climbs to another steel truss bridge and then descends by the “5 o’clock Somewhere Town” (beer & wine garden below) into a tunnel that brings it out to a train station on the left and the brewery on the right. Your train continues under the bridge to the yard area where one line passes a soccer field and a winery before entering another town. Further down the line is Aunt Bee’s Farm, ESSO refinery and old town before climbing on trestles to a mountain top to the mining building. Then across a water fall in a 4 foot covered wooden bridge descending to Sam’s farm and through another tunnel reversing your direction to head back up to the barn where you enter through the back of the barn on the main line. The barn houses four tracks of yard for staging trains. Open for tour on Monday, 26 August, 2019, 9AM to 4PM. The SC&P is a fictitious railroad set in the dry Southwest, and is wholly owned by Southern Pacific. Designed as a single track main with passing sidings, the railroad also has plenty of industrial track for switching. The roster includes first generation to modern diesel and steam operation with some custom models. All locomotives have been detailed to represent a specific prototype. The layout is in its fourteenth year of operation. South Hill Railroad is a fictional railroad with 500 feet of stainless steel track, that runs around a 30ft. x 76ft. layout where you can walk inside and around the area. I started my railroad in 2005 after seeing a friend's railroad. Bringing in tons of pickup loads of dirt to level out the area as well as concrete block to form the area around the layout. The time period for my railroad is about the time Burlington Northern merged to make the Burlington Northern Santa Fe Railway. The train travels around a down town area, around evergreen trees and plants. Passes a grain mill with its large yard, oil refilling stations and a small industrial area. I will also be showing a train honoring all branches of the military, POW, Wounded Warrior, Nursing Corps, pulled by a redecorated Burlington Northern Locomotive “1991” to honor Desert Storm. The Squak Mountain Railroad was started in 2008 and is loosely tied to the logging and mining that once took place here on Squak Mt just outside of Issaquah, WA. The layout currently consists of a folded loop main line with an over/under, a wye, a few passing sidings, industry spurs and a four track yard with connecting loop for continuous running, with the goal of expanding the layout for operating sessions. Most of the 400 feet of 332 brass track is elevated and was built using the ladder roadbed technique. 6 of the 19 turnouts are pneumatic with the remaining being manual throws. The railway has a minimum 10′ diameter turns (with the exception of 8′ turns in the shop) and a maximum grade of approximately 2%. Recent completion (spring 2019) of the 12′ x 14′ Squak Mountain train shop provides 250′ of on-rail storage/switching on two separate levels. A major expansion doubling the railway is currently underway to connect the shop to the existing railway adding several industries along the way. Motive power includes four Shays, a couple of 2-8-0’s and a 4-4-0, all of which are battery powered. Our driveway is rather steep and handicapped access is limited. No wheelchair access. The Sunny Bay Railroad is a 1930’s era narrow gauge railroad situated in the Pacific Northwest coastal foothills. Paths provide vantage points to watch the trains as they cross over 4 streams, pass by waterfalls, and wind their way through both native and imported miniature trees and shrubs. Scratch-built structures include a logging operation, two sawmills, lumber yards, numerous bridges, trestles, a national park type lodge, and several town and farm buildings that help create an authentic looking railroad. The SBRR operates passenger, freight, mining, and logging service using r/c battery powered locomotives on approximately 800 feet of track. The layout is reached from the street by crossing about 100 feet over our gently sloping lawn. There is plenty of on-street parking. Please do not park on lawns, or block any driveways. This is the home of the Sunset Valley Railroad business. 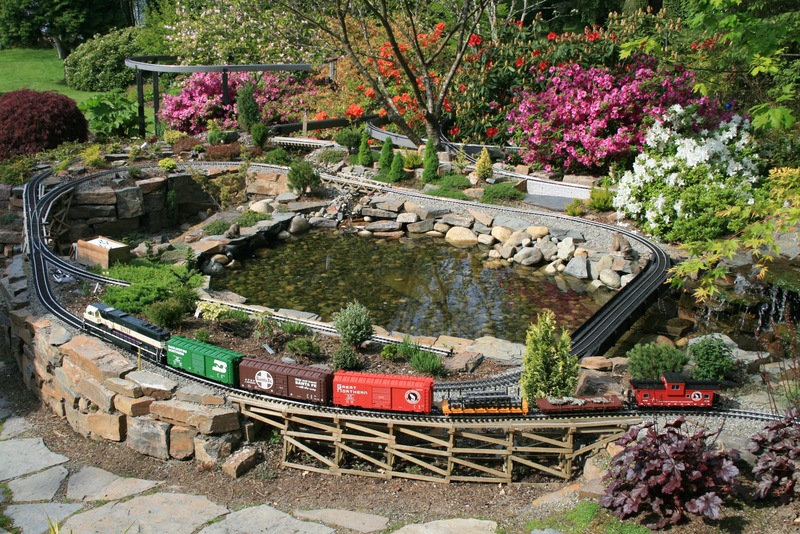 The garden layout covers a half acre and has O gauge, G gauge, 3 ½” gauge and 7 ½” gauge tracks. The main G gauge track is about 700 ft long with large 50-60 ft diameter curves for a realistic look of the trains while running, and there are several passing loops and sidings. It features a 30 ft long curved stone viaduct, a 20ft arch bridge with views of Mt Rainier behind, a small English village with its station, a canal and wharf etc. The main circuit is primarily for live steam running of long trains, a smaller circuit is for large scale, O gauge, wind up locos and other interesting trains. There is a Jolly Trolley for 3 people that runs on 300 ft of 7 ½” track, and a 500 ft track for 3 ½” enthusiasts. Visitors should expect to see English and US live steam trains storming at speed around the layout.